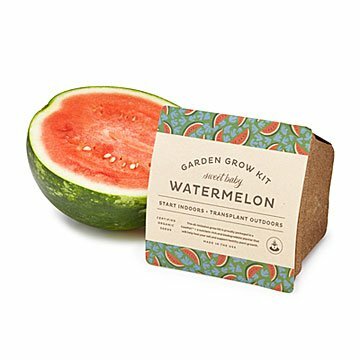 Grow sweet, picnic-ready watermelons with this kit that makes it easy and includes everything you need. Grow sweet baby watermelons with deep red flesh and lots of chin-drizzling juice to show off share at your end of summer picnics. Start indoors by placing the growing medium into the nutrient-rich, biodegradable pot, and planting the organic seeds—all included in the kit. When the seedling is ready, dig a small hole in your garden and drop the whole pot inside. The roots will push right through the pot. All you have to do is water it and watch as the vine sprouts leaves, flowers, and itty bitty baby watermelons that grow up before your eyes, ready for fruit salads and soups, cocktails, or enjoying as-is. Made in Illinois.